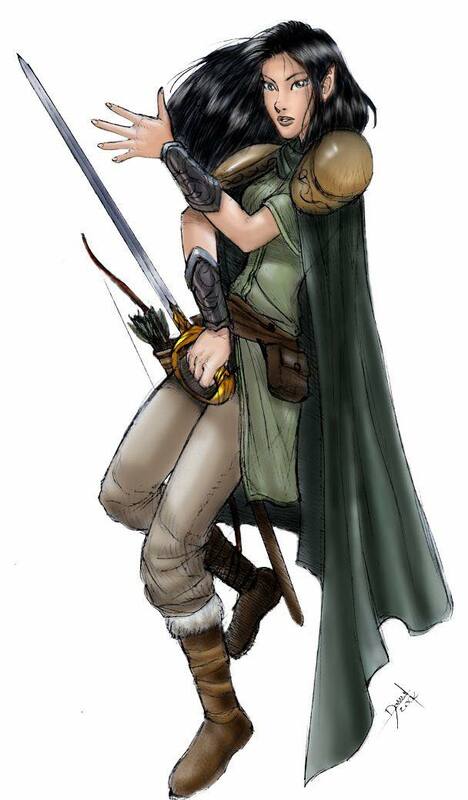 Overall Description: Keyleth has a fun loving, mischievous demeanor with a bit of a hard edge that says she is ready to spring into battle at a moments notice. She usually wears the loose, easy to move in garments of a monk of the Order of the Band, with additional jewelry. She is bursting with weapons and can use all of them. She has dragon tattoos wrapping her arms, and one peaking out of her shirt over her chest. Misc Traits: Member of the Order of the Band. Keyleth is 125 years old and at the urging of her master and her parents has just taken her adult name. She is the only child to her high elf parents. From a young age it was clear that she was going to be more free spirited than the average elf. In an effort to channel all of Keyleth’s extra energy and martial prowess they introduced her to as many different weapons and styles as possible. Nothing really kept her attention for long, although she seemed to be a natural at most of them. 200 xp “A Cleansing Trip” Downtime story. This entry was posted in Cast of Characters and tagged elf, key, monk, pc, team. Bookmark the permalink.